Since I’ve been listening to dave weckl drumming I’m listening to more Chick Chorea and all the bands, projects and musicians he’s been associated with. This lead me to the Jeff Forber Fusion group. Today was my first time listening to them and I was intending to write a review, but finding that Kenny G, and while there’s nothing wrong with him, was one of the prominent members of the group I had to ask myself if I was really going that soft. Sure I just got married but I can’t just lie down, can i? Either way, I got about 1 song in before realizing Mr G is one of the members of this group. I had to do what any metal drummer would do. Switch to High on Fire. This band is the motorcycle loving leather dude you drink with and see at shows. he rules, and he hasn’t had the gall to step down. he has a vision of his life and who he is and he lives it. This would be Matt Pike. the dude was involved in the beginning of the true stoner metal sound with his group Sleep in 1992. He’s also had an intense life. Watching High On Fire live is a trip. Dude walks onto the stage with his shirt off, hair past his shoulders and they just shred. Their intensity is half of the show. They just played Thalia Hall the same night Weckl and Mayer played at Martyrs. As a drummer I made the right decision. When you hear the name High on Fire you hear Matt’s snarling voice in your head, like at the 2 min mark on Sunless Years. He’s yelling from the depth of his lungs and his voice has yelled in a lot of faces through the years. The thunderous drums that finish the track raise the song in an amazing way to end the song. The songs tend to get into a mid tempo groove, but there’s also the rippers. Slave the Hive is a thrash jam, double bass, big fills. pissed at someone. This is one of those bands that if you like them, you really like them. There are probably some fair weather fans, but the majority are devoted. Their albums are consistently good. You know what to expect, yet there’s something new for their music. If they were to do an acoustic album there’d probably be overly dramatic reactions. Hearing this new album, Luminiferous doesn’t sound like they’ve aged or calmed. It sounds like they continue to refine their songs and collaboration as a band. The album is great. What’s difficult is to rate the album amongst the others without really devoting yourself to the songs. The title track performs as you’d expect a High on Fire title track to play. Luminiferous (the song) is a ripper. Once the song gets to the climax (you’ll know) Matt’s voice holds out for dear life, like the drop below would hurt him. The final track takes you on the familiar Matt Pike-esque journey. In a slower groove, but the middle build is a monsterous drumming experience. The only type of tension that can drop off to the slow sludgy groove they’re known for. And after listening to High on Fire for any period you must cleanse the palate with Snakes for the Divine. This is a little drum dumb assness for ya but I was thinking that it was Dennis Chambers playing drums on this album. Now before you go any further you can know that it’s Dave Weckl. My bad. The biggest problems with album like this is if you don’t know what to expect, they can be written off as a dated recording due to the very ‘out there’ sounds they used. Truth. But being released in 1986 a lot of this stuff was ahead of it’s time, and without a lot of time to actually digest how certain sounds sound, being in the tunnel of awesome it’s difficult to see what’s ‘too electronic drums’ or ‘too flaming guitar solo’ or ‘too cheesy keyboard’ sounds. In that same token, it’s what makes the music that much more remarkable. It’s the experimentation with the sounds with some phenomenal players. When it works it’s a very nice result. My favorite track on this album is ‘Got a Match?‘. When hearing this phrase I immediately think of the Beavis & Butthead movie, and now that you do too we can move on to the album. Although Rumble is somewhat uptempo and City Gate has it’s moments with some crazy drums in them, Got a Match? (see, how can you forget that scene?) is the first time the album let’s loose. The first time I heard this song I had to stop what I was doing to make sure I saved this track so I could listen to it bunch. It starts with a really awesome, yet really subdued drumming on the high hat and snare with alternating ghost doubles and a melodious keyboard line. After a short intro together the drums build adding some bass drum hits and the bass comes in. The keyboard takes you on a little journey for a minute until they come back to that hook from the intro. The beat this time includes some ride bell hits and a more complete build of the part. They meander for a bit then break for the drums to do their thing, come back for a hair then really letting the drums do their thing. Some keys and bass get thrown in but if there was ever a song where the drum solo doesn’t feel just gratuitous and is a real part of the song this would be that song. The beat on it’s own can be a solo for most drummers so the fact that it gets built up takes the song up that much further, while keeping the drums on track with the keyboard melody. Before you know it the song is over and you need to listen again to make sure you heard that correctly. Coming in just shy of an hour with 11 songs this album covers a lot of ground. The electronic drum sounds and synth sounds get a workout throughout the album, but again as you’re coming into this stuff why wouldn’t you want to see how far you can explore it and see where it can go? This album is further proof I have a long way to go to get over my ‘traditional’ jazz tastes and there are some amazing recordings out there that I’m excited to get involved with. And now for something kind of different. Although this came out in 1997 it was referred to me almost a year ago when Still Machine was having our breakup night chat. I still love those guys. I also just found out when I was going to link to the page that they put up the album with 2 listenable songs on bandcamp. Not sure if I missed that a while ago but if you’re curious in some non-metal-mike drumming check it out. I’m curious to know what you think! Being that this is one of his earlier releases there’s also a different feel to the music. If you look at his spotify artist page or hear his newer albums you can see/hear what almost 2 decades of a small underground project can turn into when EDM is now on the main stage and played at festivals with hundreds of thousands of people in attendance. This is a review of his earlier material. Having now looked it up, this album is a compilation of the 2 previously made EP’s. Although this video states the Amen Break, one of the most famous sampled drum beats ever is used on his song Vic Acid. However I swear it’s used on the opening track and even one of the later songs on this release as well. Heck, he might have even used the samples to piece together the drum sounds for most of these tracks. Drum and Bass has been a style of music I’ve always enjoyed but have never been able to fully explore and admittedly my knowledge on the subject is fairly small. However, I do enjoy this release for what it is. Finding out that this is a combination of some of his earlier works makes me appreciate the release even more as I feel like I’m going through that initial journey of audio exploration with him. Being an early in his career release it has the minimalist feel, trying not to overwhelm himself with too much going on at once and letting the drums breathe. The drumming is the most constant throughout the release with keyboard and bass accompanying the beats with a few sporadic sounds and noises to add extra dimensions. The keyboard and bass parts compliment the songs and you can feel that drums are his first instrument and he builds the melodies and bass truly around the beats, instead of the beats around the instruments. Being a drummer I appreciate someone giving drums the first love instead of vice versa. For those not too familiar with the Drum and Bass genre this is a good start to get your feet wet. It could easily go on a Jazz or party playlist and could also be used at the gym or on a running playlist. Benny Greb is another drummer that I heard about via Drumeo through their free educational videos. Each week they seem to get an even cooler drummer onto their show/site and they do a great job having their finger on the pulse of some really talented drummers. Like Snarky Puppy and Mark Guiliana, this is one of the newer dudes, at least that I’ve heard about, that is doing some amazing stuff and making me eat my words with the type of jazz that’s going on lately. It’s great and I love eating my words on this subject. Either way, his stuff, starting with the Drumeo video, is great and will easily get you hooked on his playing. He’ll do some fairly interesting fills but his grooves are nice and sweet. He lays back in the pocket but provides a unique style to the beats. Moving onto the CD it’s a laid back smooth jazz style recording with drums, keyboard and guitar. It’s airy yet direct with the melodies and grooves. Benny is of course the standout, but I’m probably biased. Tracks like Bunker show a more ‘out there’ and loose Benny, but it’s never over the top. A common theme throughout the recordings are his ability to walk a fine line between playing the tempo straight, then incorporating triplets or other off tempo style feels to the playing, whether playing in front or behind the beat. It’s a fun way to hear how he plays off the beat(s). All the songs can be used as examples of what he does Barking does a great job of using a typical beat but spicing it up to a point that it’s familiar, but clearly something he’s made his own. The album works as a whole and an educational piece of drumming music. It could easily fit on a jazz or a sunday playlist with a few songs able to fit on a party or upbeat playlist. For drum students it’s a great album to see what’s possible with some traditional instruments and an open playing style. For other instruments it’s great to hear what can happen with the drums to be able to still play fluidly with some uncommon types of playing. And to briefly brag, this Friday I’ll be seeing Benny as part of Vic’s Drum Shop all-star drum show at Martyrs in Chicago. Needless to say I’m pumped. But in the meantime I’m off to practice drums. 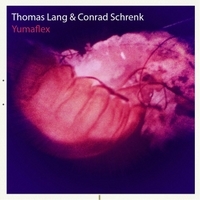 BuyThomas Lang & Conrad Schrenk – Yumaflex listen here. If you’re going to scour around the internet for some of the top drummers today you’re going to come across Thomas Lang. He’s the ‘Terminator of the drums’ (he’s Austrian). Being a contrarian when I hear so much about someone and how great they are I want to ignore it and move on to someone else to give them my attention, but really after even just watching his Drumeo video it’s easy to see why so many people gush over him. His technical prowess is one to be admired and something to aspire to as a drummer. If you were to take ‘The books’ that drummers and drum teachers would suggest to learn (Stick Control, 4-Way Coordination, etc) and learn to play them like a robot the culmination would be this dude. He plays so smoothly between both sides/all limbs and he’s clearly just practiced these books. This would make you think he can just sight read and play like the page suggests, with no style but just how the greats before him wrote it. So how can he play with a group? Pretty well. His discography includes a number of musicians he’s played with as a session player. As technically savvy a player as he is you could assume a session would go very smoothly, with a “hey do this” and bam it’s done in a take or 2. That’s always fun but releases like this are where someone with that broad of an experience can let loose and have fun. As shown in Yumaflex it’s almost an exercise in the style of all his interests, starting with rock metal, moving over to a Primus/Meshuggah style metal, onto the beach, into the desert, and well, you get it. It almost plays like a demo reel of all the styles Thomas is capable of playing. This release proves that he can groove with the best of them, especially over such a diverse range of genres. This release will most likely appeal mostly to the drummer, but there is some shredding on the guitar that could appeal to the string lover in your life as well. Whether you’re looking to improve your playing or just looking to expand your horizons this release is a great gateway into what drummers can be capable of doing. Although it may be wishful thinking on our parts that this is where the bar is set. I just need 5 more words. What a pleasant surprise. There I was enjoying myself at the SubT on Friday when I received an email that these guys (and 1 gal) released something new on bandcamp! I first heard about them when my last group Still Machine was offered to play a show with them. I was looking up the different bands to see with whom we’d fit best and once I made it to them I listened to Thereafter all the way through, then again. Since this is a review of the latest, I won’t talk about how in love I am with Thereafter. I will say that even though my band didn’t play the show with them, I still dragged Aaron to the show with me and watched them play in front of 15 people, most of whom I don’t think were prepared for the onslaught of insanity they were witnessing. That might have made it an even better show, because they still put intense focus onto their instruments and played like mad people. My only complaint was that they didn’t play Thereafter straight through, instead jumping around between releases. But back to Fear Eats the Soul. They clearly have a style. You could put one of these songs in between their other release and it could be the same release. In the last album they focused on the triplet to enter and exit their phrases. Here seems to be doubles, but they do switch it up a bit. If I had to pin them down I’d call it progressive punk, since they typically focus on speed. One of my band mates replied that they’re ‘technical smilecore’. Apt description. I could only imagine trying to have a conversation with this group. It would probably jump from one topic to the next every few minutes, getting to the heart of the subject quickly before switching to the heart of something else.